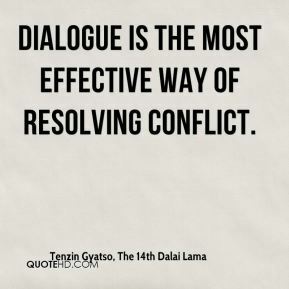 Dialogue is the most effective way of resolving conflict. 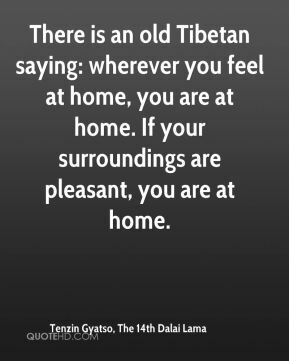 There is an old Tibetan saying: wherever you feel at home, you are at home. 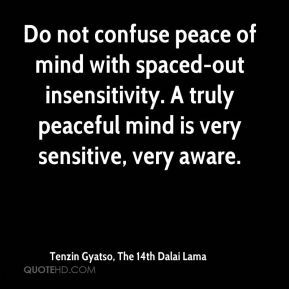 If your surroundings are pleasant, you are at home. 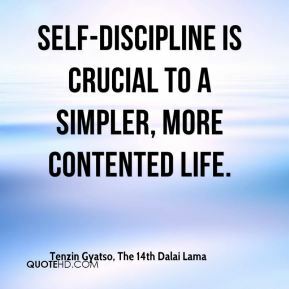 Self-discipline is crucial to a simpler, more contented life. 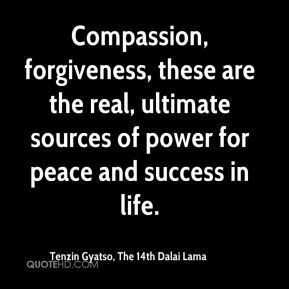 Compassion, forgiveness, these are the real, ultimate sources of power for peace and success in life. 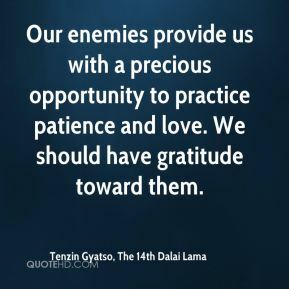 Afflictive emotions - our jealousy, anger, hatred, fear - can be put to an end. 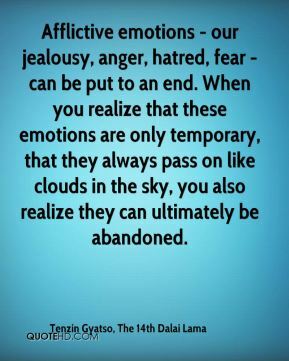 When you realize that these emotions are only temporary, that they always pass on like clouds in the sky, you also realize they can ultimately be abandoned. 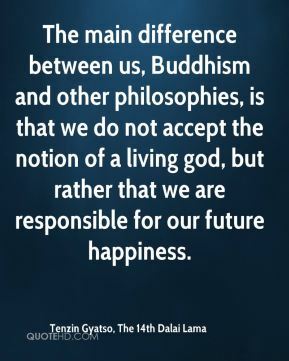 The main difference between us, Buddhism and other philosophies, is that we do not accept the notion of a living god, but rather that we are responsible for our future happiness. 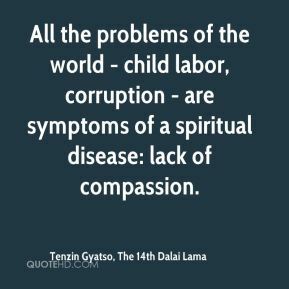 All the problems of the world - child labor, corruption - are symptoms of a spiritual disease: lack of compassion. 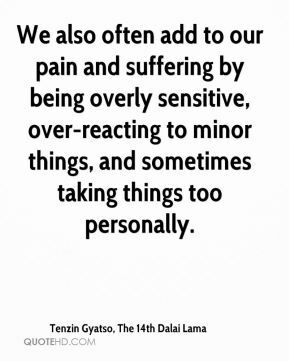 We also often add to our pain and suffering by being overly sensitive, over-reacting to minor things, and sometimes taking things too personally. 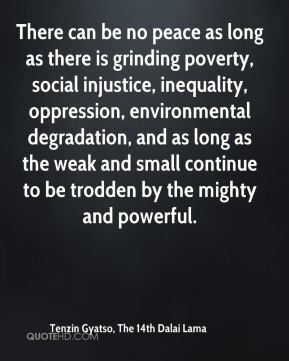 The true antidote to greed is contentment. 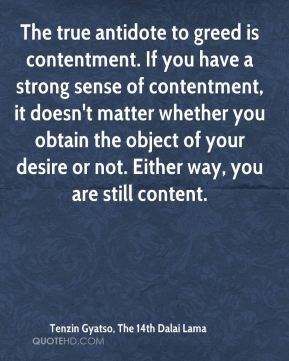 If you have a strong sense of contentment, it doesn't matter whether you obtain the object of your desire or not. 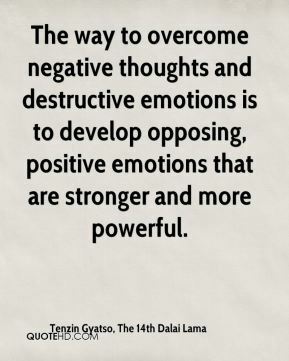 Either way, you are still content. 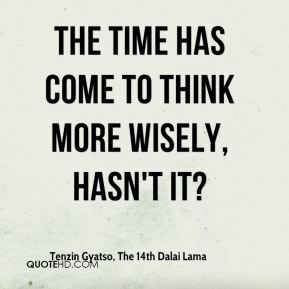 The time has come to think more wisely, hasn't it? 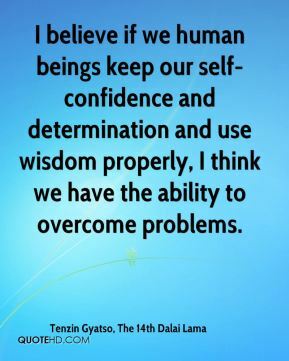 I believe if we human beings keep our self-confidence and determination and use wisdom properly, I think we have the ability to overcome problems. 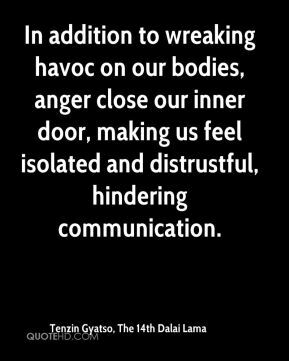 In addition to wreaking havoc on our bodies, anger close our inner door, making us feel isolated and distrustful, hindering communication. 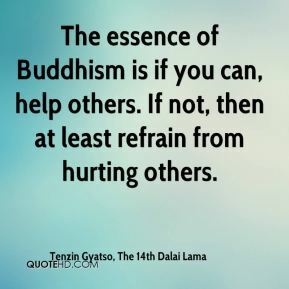 The essence of Buddhism is if you can, help others. 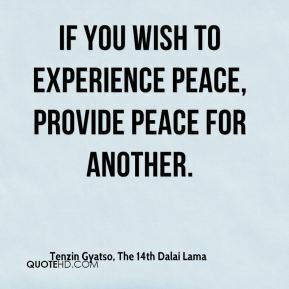 If not, then at least refrain from hurting others. 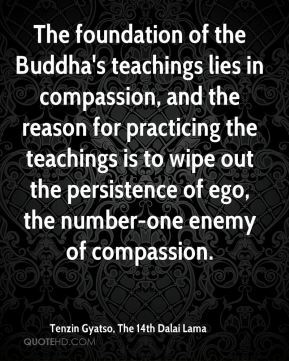 Some consider me as a living Buddha. 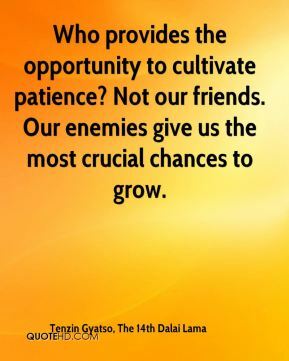 That's nonsense. That's silly. 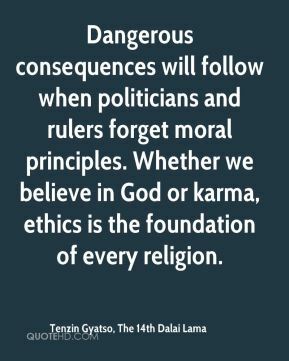 That's wrong. 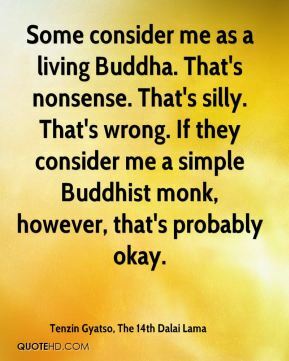 If they consider me a simple Buddhist monk, however, that's probably okay. 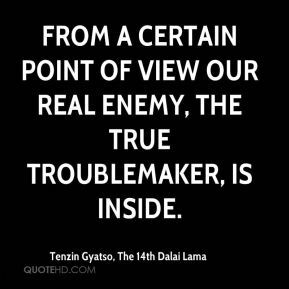 The deep root of failure in our lives is to think, 'Oh how useless and powerless I am.' 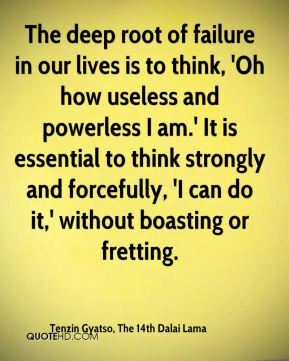 It is essential to think strongly and forcefully, 'I can do it,' without boasting or fretting. 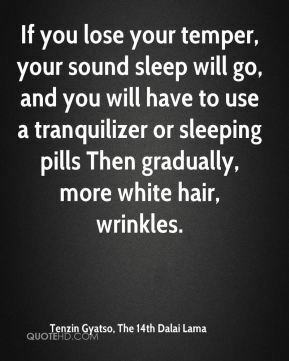 Then gradually, more white hair, wrinkles.